Saying it’s been a roller-coaster of a ride with Zia and her eczema is an understatement. 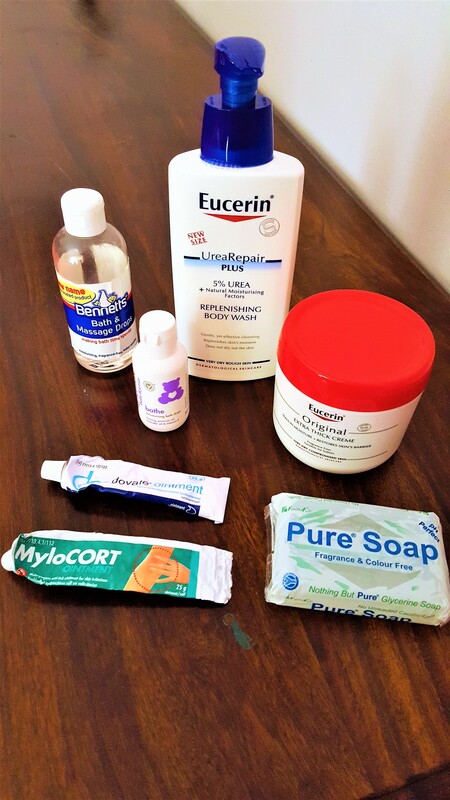 The poor child has suffered practically all of her short life with eczema and it can get pretty frustrating for me as a mom, because you really can’t help much after you have done all the necessary things to alleviate the flare-ups. Now imagine actually living with it. We have been in and out of dermatologists offices, who explained that she has two types of eczema. The first is genetic, and this form of eczema she got from her dad’s side of the family and the second, is temporary, which means that she gets these flare – ups that are crusty and dark rash like spots that forms on certain parts of her body that itch like hell. The flare-ups are normally located behind her knees, the skin in the groove of her elbows and her back that goes away when it’s treated. Her skin is always dry and that causes the itching. The itching occurs at night and I try my best to treat the affected areas but she still scratches herself daily and some nights she cries out for me because the itching is so severe. When this happens I normally re-apply the creams and treatments. I know that it’s possible that the itching is caused by her diet. The girl eats everything. So trying to get her to eat only specific foods is hard because she is only six years old and doesn’t understand why she can’t eat certain types of food and Tazkia can eat “whatever she wants”. We have taken her for allergy testing too, and the test came back with the results that she is borderline allergic to eggs, and she seems to be okay with other foods as no allergic reactions happened so far and she still eats egg. The test was done when she was a baby, and I’m pretty sure she is due another test soon. She has become very self-conscious about her skin and the scars that was left after the scratching. She isn’t as confident in herself as she used to be and I speak to her everyday about trying to leave the affected areas to heal and go away on its own. The ugly marks is a reminder that she deals with eczema daily. The message I try to convey to her is that she is beautiful regardless of the scars and marks and this is just a huddle that she needs to cross to get to the other side. I treat the scars with tissue oil but its fragranced and an oil so I think that the combination might not actually be good for her skin. The last thing I want is to make the affected area worse. I’ve applied different types of lotions and creams to moisturize and treat her skin on a daily bases. All of them hypo-allergenic, fragrance free, chemical free etc. I always have allergex syrup on hand for the extreme cases of itching. Dovate – this is a steroid cream that works very well with flare – ups and should only be used for short periods of time. You can only get this product at a pharmacy and with a prescription. You can purchase the Mylocort and Dovate creams and the Allergex at Checkers Pharmacy or any other pharmacy close to you. I’ve just started getting the hang of baby brother’s eczema routine, so I will write a blog post about his story soon. If you know of any products that I can try on Zia then please let me know by commenting below. 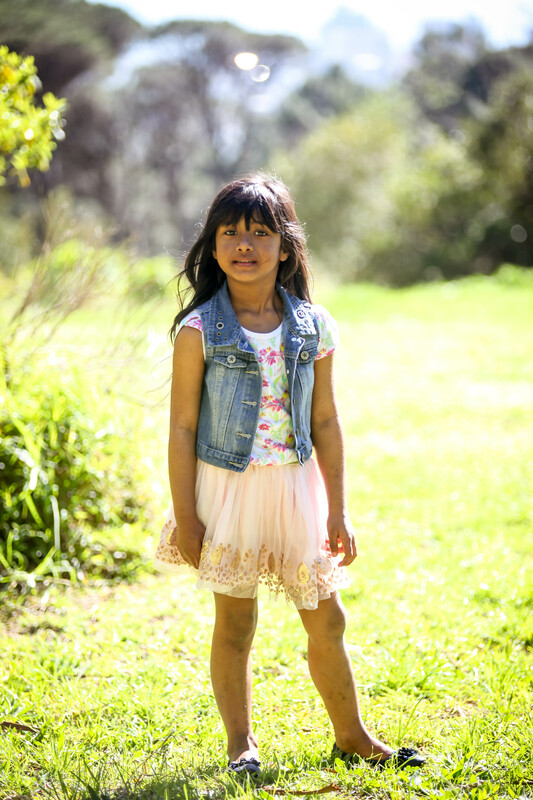 Maliha who is 2 now has also been diagnosed with eczema this year. Her skin is very dry all the time. What has helped us a lot is Advantan which you need a prescription for. We only use it for flare ups which is probably like the Dovate. The other thing which helps ALOT is emulsifying lotion. We use it to bath her in and also use it as a moisturizer. Not everyday. We were lucky enough to have gotten it from someone whose daughter is being treated for eczema at Red Cross. We sometimes apply this with Lenovate (on the bad areas) and wrap her overnight. We use plain Dove or baby Dove soap to bathe her most times and Omar normally makes the decision on what to apply to her skin on a daily basis. Her Aunty brought a creame called Aveen (will have to confirm that name) from Australia which I haven’t seen here. We’ve been using it for the past few days and it’s working really well with the dryness. My mom also just gave me the emulsifying lotion (it comes in a brown tub?) but i havent used it enough to recommend it. I dont use anything that has a fragrance in it, only shampoo, thats about it. I would say stick to the same things, and try not to put too much stuff on, the products i use might sound essessive but it really isnt. and its used for different things. but mostly to bring moisture and hydration back into her skin that is very dry. This post has just made me wonder if what I am suffering from is eczema!!! Urgh …. I feel your pain. My 4 year old has it bad too, ever since she was about 6 months old. From then I had to have her on Nan Hypoallergenic. It’s so hard for them, but for now I have it pinned though, until tomorrow. You understand the rollercoaster! I do know that any acidic fruits cause her flare ups: Strawberries (the main one), tomatoes, oranges, lemons etc. Even sour worms (the sweets). And unfortunately those are all her favourite things. Poor kid. She’s pretty good though. Summer is hard because of the swimming & extended time in the water. Winter is worse because of the dry air. 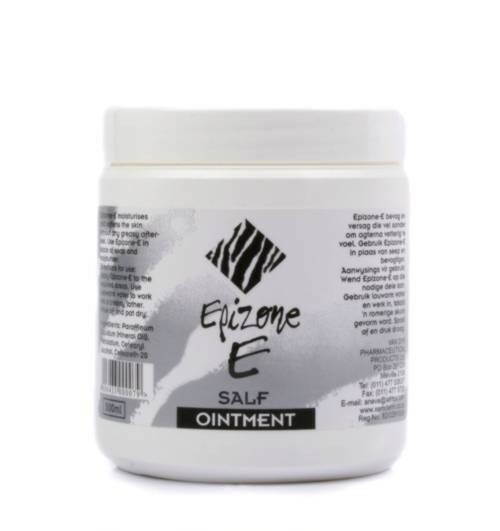 We use Epizone E to bathe her with, and then when she has bad spots we put her on Advantan which is a Steroid based cream available only on prescription. I hate it, but it’s the ONLY thing that gets rid of the bad flare ups. Yeah they are so many treatments out there for eczema and its hard because different treatments work on different people, but hopefully its just a phase. My 6 month old has eczema and I am struggling to keep it under control! Saving your post for sure!! Thanks Jean, the struggle is real i know, my two month old has eczema too. Let me know what you use on baby? Hi Sadiyya, thanks for the suggestion, i will definitely check it out.